Photogenic Bruges is a favorite with travelers the world over and one of the most popular tourist destinations in Belgium. Oftentimes you’ll see its name written as Brugge (in Dutch) since originally it was part of the Netherlands. Its historic center, a UNESCO World Heritage Site that is closed to cars, is chockablock with beautiful medieval buildings and other places of interest and is quite easy to navigate. You can easily see it by foot since it is eminently walkable, by boat on its quiet canals, or via horse-drawn carriage on its cobblestone streets. Each provides a slightly different perspective of the incredibly beautiful city. 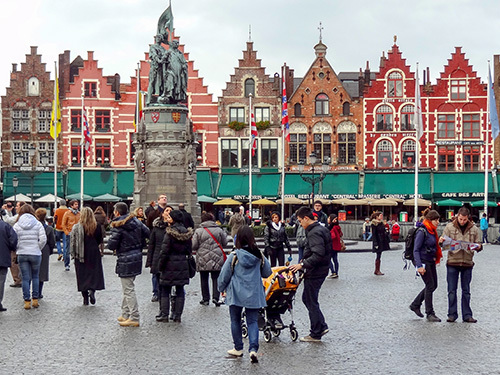 Bruges owes its well-preserved and magnificent architecture to its position as the center of the cloth trade in the 13th-15th centuries, a time when the city’s merchants lavished their wealth on their mansions, civic buildings and churches. In fact, the city’s buildings were so beautiful that they were the sensation of northern Europe at the time. Luckily, the city has retained its ancient beauty and today is filled to the brim with architectural and artistic treasures, as well as chocolate shops, lace boutiques and fine restaurants. The following are seven top places in Bruges that are certain to enhance your visit. This is the area of the city that impresses most travelers, the historic center of medieval buildings crisscrossed with old canals and cobblestone streets. It’s Old-World Belgium at its best. Walk about the Center and you’ll feel that you’ve stepped back in time. The area’s restored buildings once housed merchants; today they house coffee shops and cafes, art galleries and boutiques, museums and shops selling chocolates and lace and plenty of fine restaurants. It’s best seen with a map stuck in your back pocket while walking along aimlessly, letting each little street or lane draw you in. The “nerve center” of Bruges, as Lonely Planet calls it, is a beautiful square that surrounds the statue of Jan Breydel and Pieter de Coninck, 14th-century local heroes who resisted French oppression. Dominated by the imposing Belfry, the broad 13th-century market square (which covers an expanse of approximately 2.5 acres) is lined with medieval buildings and old guild houses with step-gabled facades that house numerous (and relatively expensive) pubs and restaurants that tumble out onto the square below. 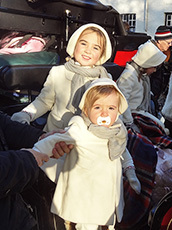 It’s a great place to people-watch or to hire a horse-drawn carriage. 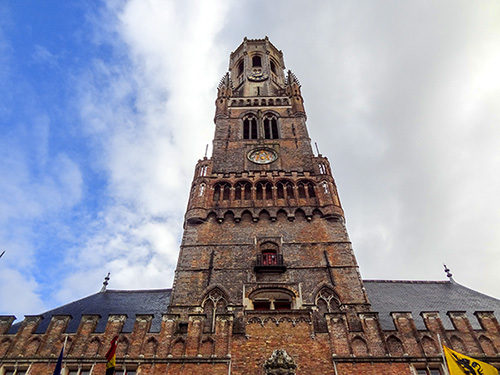 The most imposing building on the Markt Square is the 272-foot tall belfry, which forms part of a 13th-century complex of halls that served as a warehouse and a market hall in the Middle Ages. The tower contains a carillon with 47 bells and also the old city Treasury that housed the city’s charter, seal and public funds during the Middle Ages. Those looking for a panoramic view of the city will find the Treasury halfway up the 366-step climb to the top, which was used as a look-out in case of war, fire or other calamity in the Middle Ages. There’s an art gallery at the base of the building. The Prinselijk Begijnhof ten Wijngaarde, known today as The Begijnhof, is a ring of small white-washed houses that surround a central lawn in a park-like and garden setting. 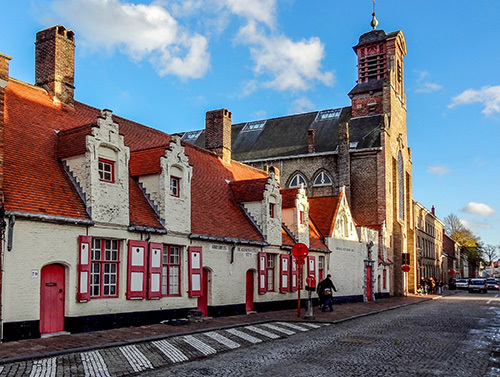 This serene place was once the home of Beguines, girls and widows from a variety of social backgrounds who devoted themselves to charitable work. The group was founded in 1245 by the Countess of Flanders, Margaretha of Constantinople. 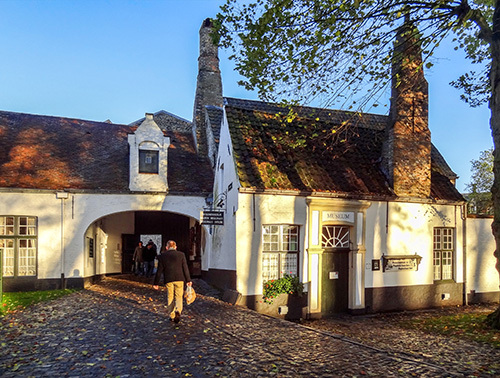 Today the Begijnhof is home to the sisters of the Order of Saint Benedict (who still wear the Beguine habit) and visitors are requested to respect their vow of silence. 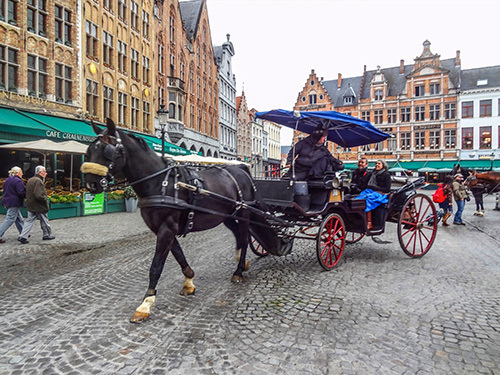 If you take a horse-and-carriage rides around Bruges your driver will likely make a 10-minute stop here, long enough for you to cross the small entrance bridge for a quick look around. If you visit the Groeningemuseum, Bruges’ renowned 11-room art gallery, you’ll realize that size always doesn’t matter. 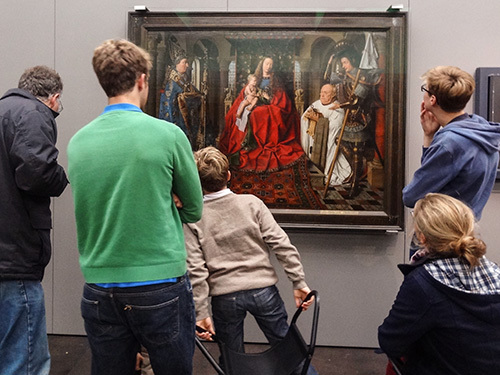 Even though it’s not as large as renowned art museums in Brussels and Antwerp, it’s a fantastic and celebrated museum that houses Belgium’s finest collection of works by the Flemish Primitives, including Jan van Eyck, Hans Memling, Rogier van der Weyden, Hugo van der Goes, and Gerard David. The Groeninge also contains top 18th– and 19th-century neoclassical pieces as well as masterpieces from Flemish Expressionism and post-war modern art. 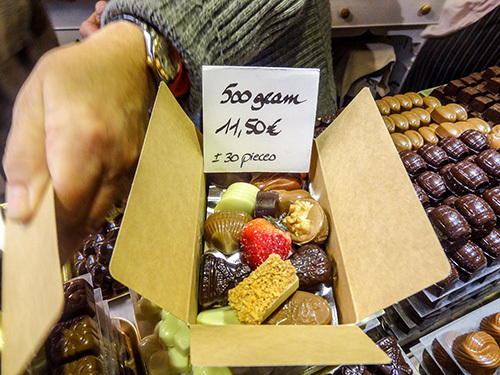 Bruges is as famous for it chocolate as it is for its medieval architecture and you’ll likely never be more than a few steps away from a chocolate shop nearly anywhere in the old, historic center (see In Search of the Best Chocolate in Bruges, Belgium). My favorites include Dumon Artisanale Chocolatier (Eiermarkt 6) and Dominique Persoone (Simon Stevinplein 19) but you’ll likely find your own favorites. If you want to find out more about chocolate visit the privately owned Chocolate Museum (Choco-Story, Wijnzakstraat 2) where you’ll find the answers to such questions as to whether does it causes high cholesterol, makes you fat or is an aphrodisiac. 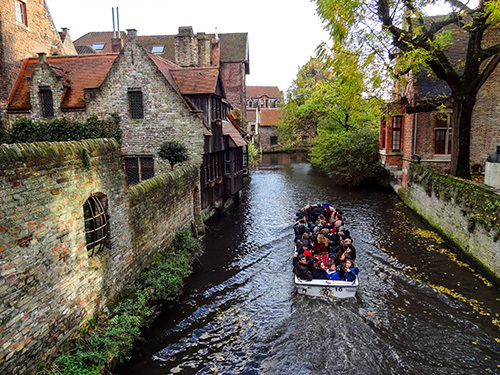 Yes, canal tours can be touristy but in Bruges, where canals are such an important part of its history, you’ll get a very different feel for the city than you do walking about it. Just be aware they can get very warm on a hot summer day, and quite chilly on a cold winter one. Still, they’re fun – just dress appropriately. Bruges is high on my list too. It was about 1964 when our family, husband, little daughter and I, went to Bruges (we lived in London then). Without knowing anything about where to stay, we chose a small hotel near the cathedral and right on the river. It turned out to have been Winston Churchill’s favorite hotel and he’d given many of his paintings to them. They were hung alongside the stairs. The bells rang out all night and as I couldn’t sleep, I just sat on the window seat and watched over the beautiful city. What a wonderful story and memory Dotty!